Act on Climate Change – Together, Now! The Ying Wa Girls' School team won the Best Presentation Award with their outstanding performance. 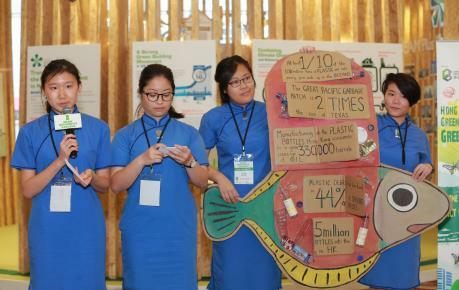 A group of environmentally concerned Form 6 students with an innovative mind were brought together at the Hong Kong Convention and Exhibition Centre on 7th June to take part in the English speaking contest Green Ambassador Pitch, a programme of the Hong Kong Green Building Week (HKGBW) 2017. The contest, co-organised by the Construction Industry Council (CIC) and the Hong Kong Green Building Council (HKGBC), is a brand new programme HKGBW 2017. The theme of the contest is “Act on Climate Change – Together, Now!”. 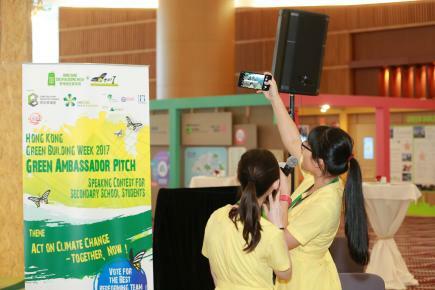 It aims to raise students’ awareness of climate change. A total of 17 students formed six teams and joined the contest. 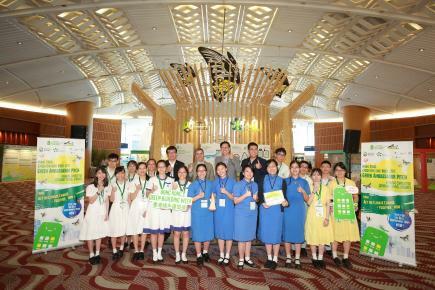 During the international green building mega event World Sustainable Built Environment Conference 2017 Hong Kong (WSBE17 Hong Kong), student teams presented their ideas on how to get the people around them involved in combating climate change to the judging panel and green building experts from all over the world to compete for the Best Presentation Award. Participating teams were from Buddhist Sin Tak College, CCC Heep Woh College, Diocesan Girls' School, Immaculate Heart of Mary College, NLSI Lui Kwok Pat Fong College and Ying Wa Girls' School. To prepare for the contest, students researched the topic and attended workshops on 20th and 27th May to learn more about climate change, green building, community green works and English presentation skills. Many of the young participants were experienced in debate and public speaking. They were composed and self-assured even when presenting to international experts, and put up a brilliant display of ideas. In the end, Ying Wa Girls' School got the highest overall score and came out as the winner, taking home the Best Presentation Award. Mr Cheung Hau-wai, Chairman of the CIC ZCB, was amazed by the outstanding performance of the students. "The CIC fully supports the programme as we believe it is a great summer event for students to learn more about climate change and green building. The students’ performance showed that they are very well prepared, and able to put what they have learned into practice. I hope the contest has inspired the students to think more about the environment, especially the role of buildings in mitigating climate change. I also hope they would support green building development, practise the essence of green building in their day-to-day life and encourage the people around them to change their behaviours, starting with daily habits like saving energy and reducing waste”. Another member of the judging panel, Sr Bay Wong, Chairman of the HKGBC, was impressed by the students’ ideas. “We should all make an effort to help protect the environment, and it is equally important to motivate the people around to join them. This contest is a good start. I hope students can make good use of what they learned to do something for the environment. They can start with themselves, and then spread the influence to their families, friends, and even the local community, so that combating climate change will become a city-wide movement”. Other members of the judging panel were Mr Curt Garrigan from the United Nations Environment Programme and Mr Tony Ip from Friends of the Earth (HK). The judging panel scored the teams based on their presentation skills and the presentation content’s relevance to the theme, feasibility and creativity. Audience voting also formed a part of the scores. HKGBW 2017 is fully funded by the CIC.